Bryan Singer (director): I don't think about that stuff. Our tone is a bit darker and edgier than the previous one, and is a little different than the tone of Spider-Man. It's nice, because Spider-Man has raised the awareness of comic book adaptations. Beyond that, we need to make our own movie. 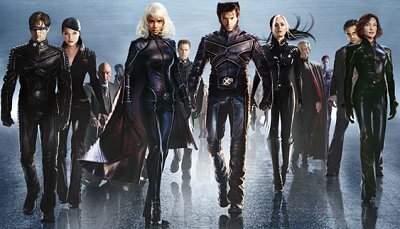 And I don't want to draw comparisons to the two X-Men films -- but it's kind of like the way The Empire Strikes Back explored the weaknesses and the potential of the group in their attempt to triumph over evil. This is the same kind of story. You get to see everyone's weaker side. Definitely Xavier has weaknesses. Even Magneto, they both have flaws, but both are not entirely right or wrong. Ian McKellen (Magneto): I'm attracted to the X-Men because of the moral basis which, frankly, I think is a great deal more interesting than Spider-Man, which is exactly the same story as Superman: A nerd becomes a hero. Our movie is about politics, about what it's like to be in the real world, even though it's a fantasy. Patrick Stewart (Xavier): This film is a leap forward from the first film, which was a very extended trailer introducing the characters and the role of mutants in society. I know this because I had a lot of the exposition in the first film! And this film takes the characters forward. McKellen: I’d worked with Bryan on Apt Pupil and he asked me to be involved in his next project. He had to explain the story in terms of the argument between Professor Xavier and Magneto about what to do if you’re a mutant -- either fit in or take on society. This is an argument that goes on within any civil rights movement. There are obvious parallels with the gay movement. Do you write letters to the Prime Minister or do you go out in the streets and get violent if necessary? As long as the scripts are good and the intention of the script is good, I’m there. I don’t feel any difference between jobs. I just ask: Would I like to see it on stage or screen? I do all kinds of things -- I’ve been in comedies, musicals, Shakespeare. I’m even planning to be a pantomime dame! I don’t think of myself as a Shakespearean actor. Stewart: I think the two of us were fortunate. When we began acting we played a wide variety of roles. It’s never been an issue for me either; we get typecast as different kinds of characters all the time. Hugh Jackman (Wolverine): I had a huge reverence for these guys when I was studying acting. I watched their stage performances and I was mesmerised by them. They’re the things that crystallized in me that I wanted to be an actor. So as a theatre guy, for my first Hollywood picture to be with these guys I was a little in awe -- nervous and excited. McKellen: Actors are impressed with each other in general. I’m impressed with everyone. I mean, Anna Paquin won an Oscar when she was 11! And I thought of Hugh Jackman as a song and dance man after seeing him in Oklahoma at the National Theatre. I’m just happy to hang out with the youngsters.